When I came here back in April, B'Stilla was still the new kid on the block. 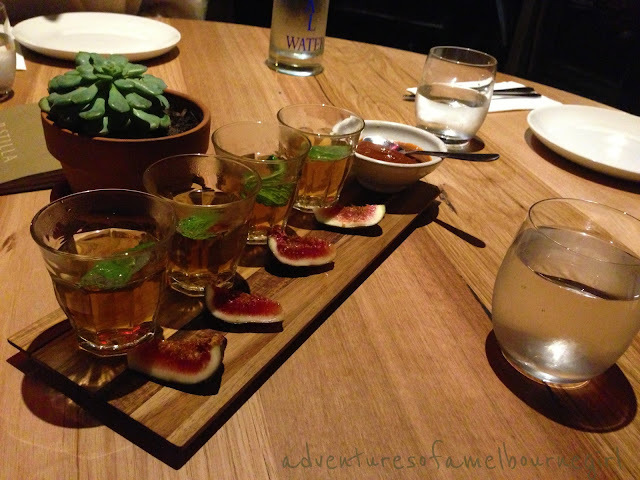 It is responsible for planting the food blogging seed in my mind, and as such, I figured I owed it a tributary post! The girls and I visited on a cold Autumn night, in celebration of two 22nd birthdays in our group. Under J's suggestion (a foodie just like myself), we chose to treat our tastebuds to something new and different, like Moroccan. Upon entering, you wonder whether you've perhaps mistakenly stepped into the bar instead of the dining area, but the variously sized tables and chairs under the dimly-lit, mood-lighting of the ceiling lamps suggest that, alas, you are indeed in the correct area. 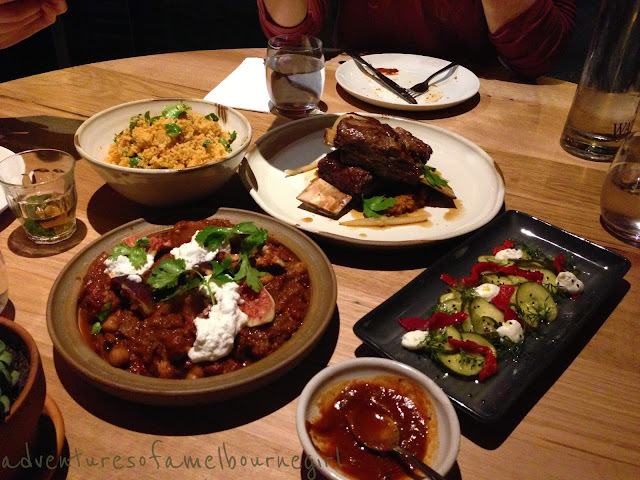 After being seated promptly, the alternatively dressed waitress began by describing the sharing style of the dishes - they're made smaller, as has become quite popular amongst the Melbourne restaurant scene, so you can experience more of the menu. Once the difficult decisions had been made, we were treated to a complimentary traditional Moroccan starter. We were kindly explained that harissa was a traditional spicy Moroccan condiment, comprised of chili and piri piri, and it could be used to accompany our mains. Obviously we could not go without ordering the signature dish and the restaurant's namesake, the B'Stilla. The thin and buttery pastry has a deliciously crunchy crumble with a special surprise inside. I enjoyed the interplay of different nutty, meaty and crusty textures along with the combination of sweet and savoury flavours, as it was something completely different to what I was used to. 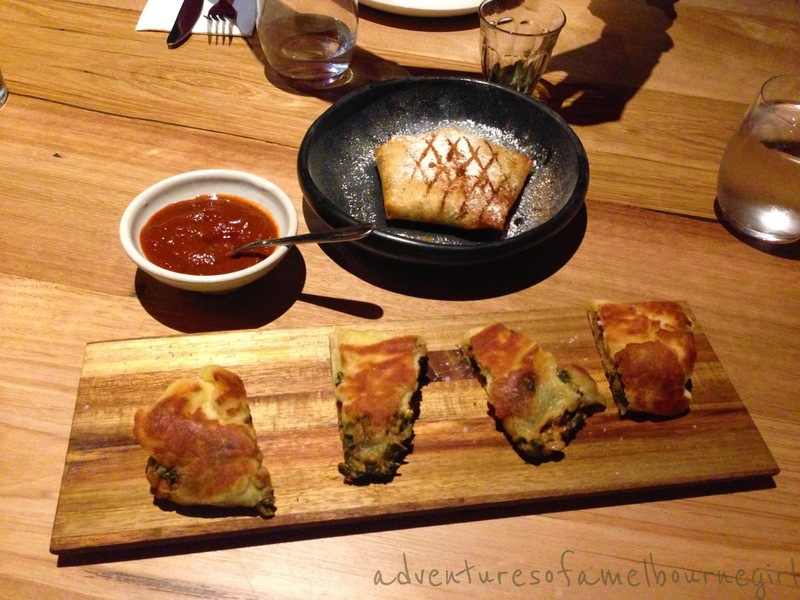 But the rgahaif was the winner on our table - something a little more familiar to the tastebuds, it was an interesting interpretation of your typical spinach and ricotta pastry - and with a bit of harissa on the side to add some spice? Absolute perfection! While we were devouring our entrees, the mains were being served. The tangine, again, combined the sweetest of fig flavours with the more savoury, earthy flavours of the vegetables tossed up with various spices, that were ultimately brought together by the cool, goat's cheese. The cous cous was an enormously generous serving, that was nice when paired with the tangine, but on it's own I found it to be a little too citrusy. The beef short rib, on the other hand, was difficult to fault. The meat was so juicy, so tender, it literally slid off the bone and melted in my mouth. And finally the cucumber salad - a quiet achiever, light and refreshing with a touch of seasoning. By the end of the night, we were all pleasantly full and satisfied with our evening of exotic Moroccan dining. The chill lounge music that played in the background, along with the presence of the bar in the dining area, creates a comfortable and relaxed atmosphere, making you feel like you're dining out in a restaurant out of a movie. A fine Moroccan experience for all indeed!